2. 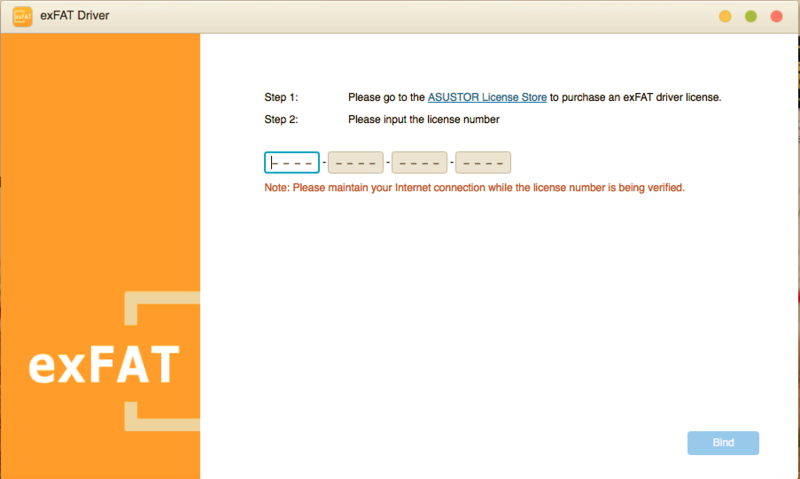 Purchasing An Authorization Key To Unlock The exFAT Driver. To save data to a hard disk or flash drive, you must first format the disk and choose which file system to use. Different file systems determine have different limitations and the maximum size of a single file that can be supported may vary between file systems, as well as which operating system the storage device can access. 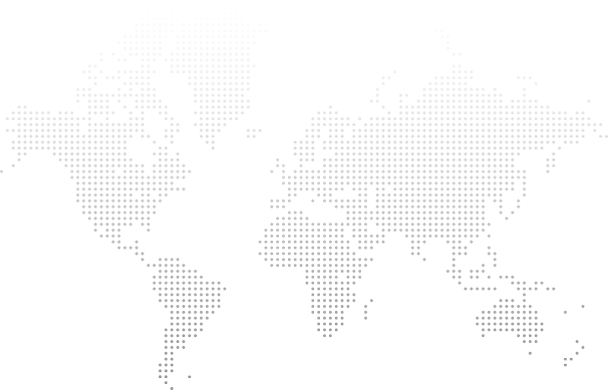 Common file systems include FAT32, exFAT, NTFS, EXT4, HFS+. 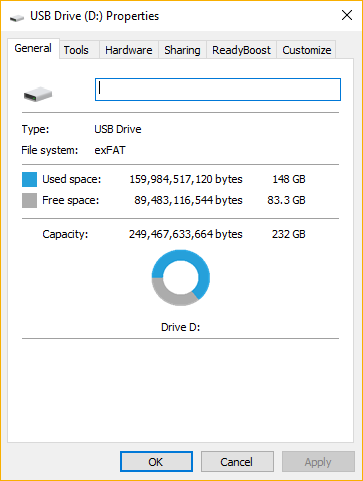 exFAT Is Microsoft's archive system for large-capacity external storage devices. 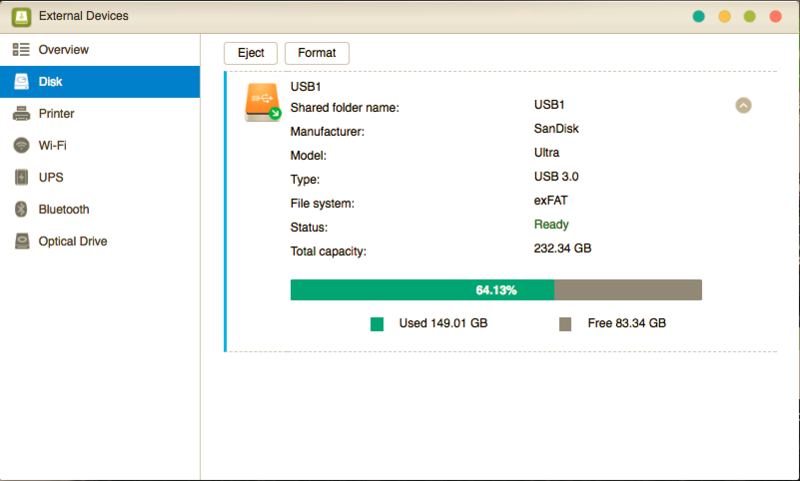 FAT32, which has been common on flash drives for years cannot store files larger than 4GB. 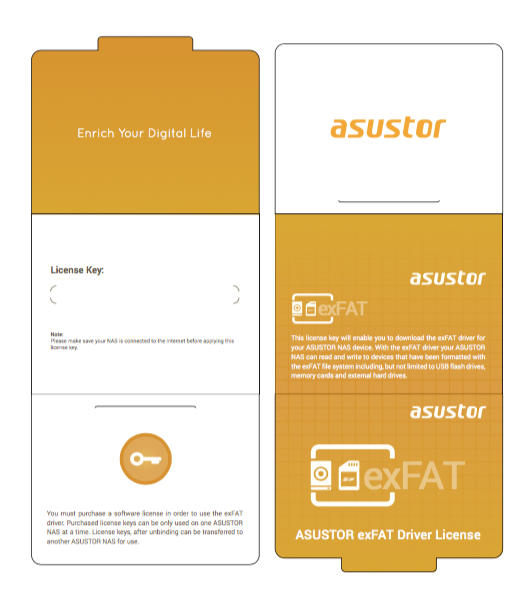 exFAT can exceed this single file size limitation, but also perfectly supports 64GB or larger external storage device such as flash drives, and memory cards. As a result, many commercially available high-capacity flash drives and memory cards are preformatted as exFAT. Sign in to ADM. 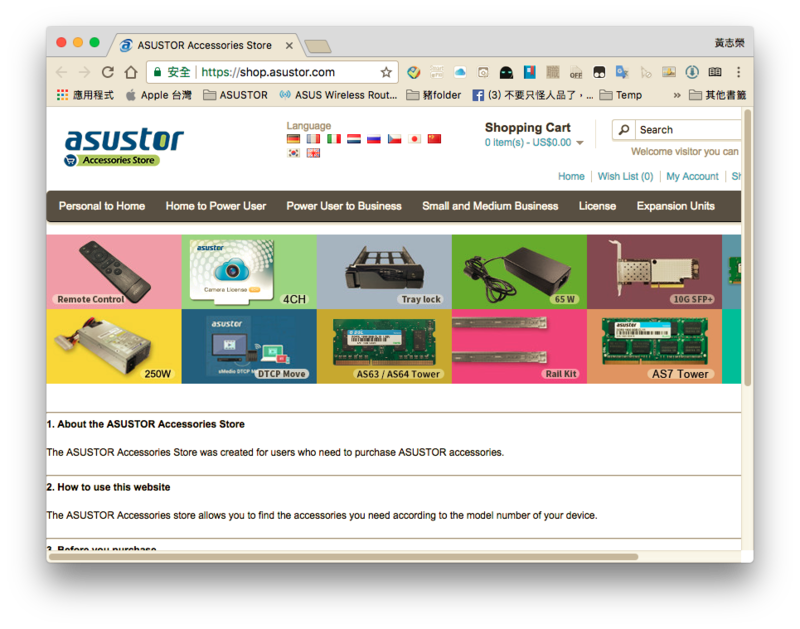 Afterwards, click [App Central], then click on [ASUSTOR Apps]. Select the exFAT driver. Click on install. Once the exFAT driver is installed, return to the ADM front page. The exFAT driver icon shall appear. Click on the exFAT driver icon to open the app. The exFAT driver app requires a purchase to function properly, so installation alone does not enable the use exFAT storage devices. After a successful purchase, please wait a few days to receive your exFAT driver digital authorization key. Keep your authorization code in a safe place. Afterwards, how to use the authorization code to unlock the exFAT driver and binding your key to your NAS will be demonstrated. Please open the exFAT driver app, enter the authorization key and press the bind button. ADM will then confirm if the authorization key is correct and bind the key with the NAS. For instructions on how to use an exFAT device, please refer to section 3.1. 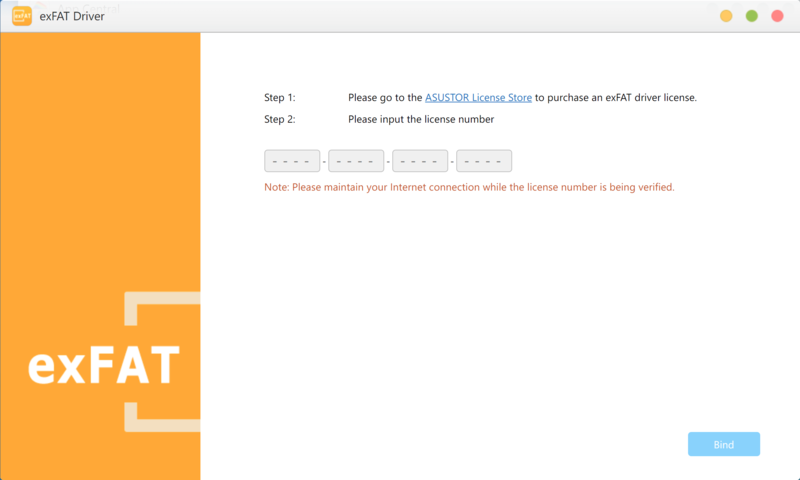 Note: When verifying the authorization key, please maintain a connection to the internet. Purchase of software license key, only the same time a ASUSTOR NAS use, but can be transferred to other unbind ASUSTOR NAS. Purchased exFAT driver authorization keys can only be used on one NAS at a time, however, you may transfer your key to a new or different NAS if you desire. You must first unbind the key from the first NAS before transferring to a new NAS. Unbinding is quite simple. Please input the original authorization key on your old NAS into the exFAT driver app and press “unbind”. 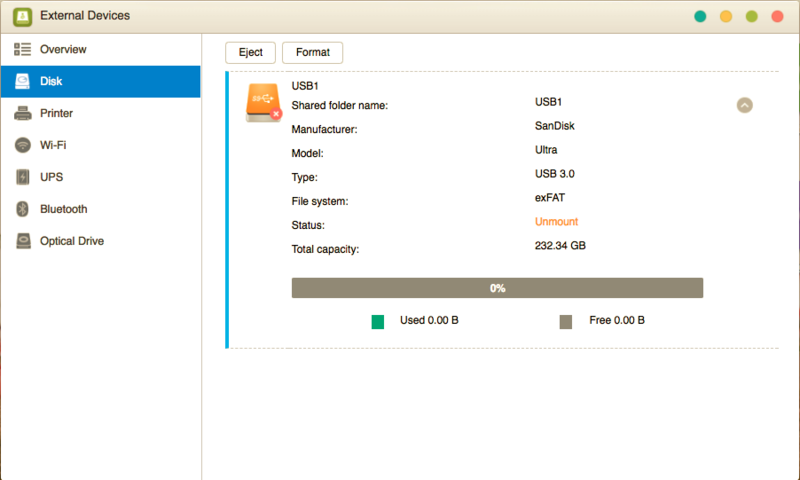 After being unbound, this NAS will no longer be able to access exFAT storage devices. 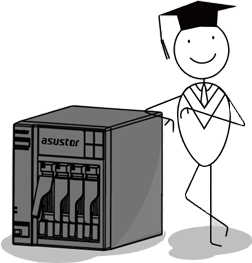 If you need to have exFAT support on more than one device simultaneously, please purchase an exFAT license for each ASUSTOR NAS. When the authorization key has been unbound from the first NAS, please enter the key into the second NAS and press “Bind”. If you lose your purchased authorization key or if the NAS is damaged and cannot boot, you will be unable to transfer your exFAT license. 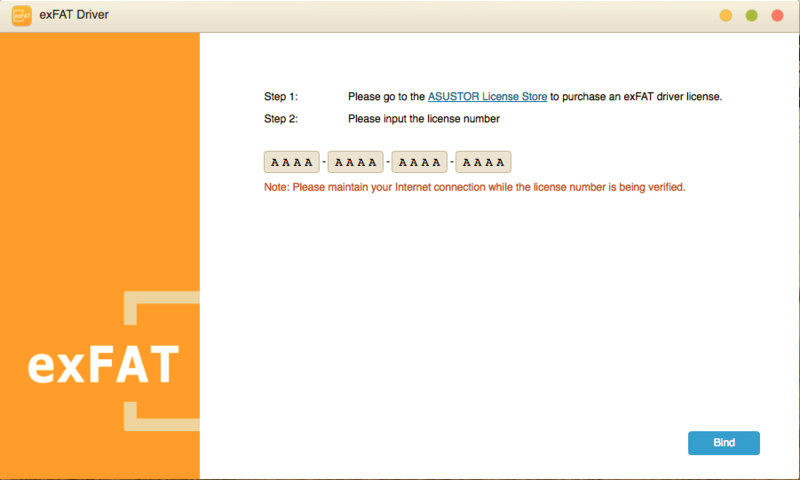 If this problem occurs, please contact ASUSTOR Service Center. 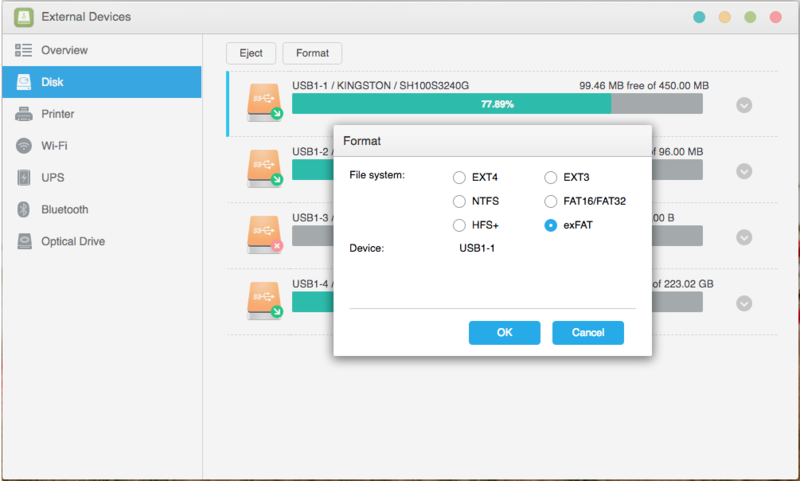 After you have successfully bound your key to the NAS, you may immediately begin using, reading, writing and formatting exFAT devices without additional setup. 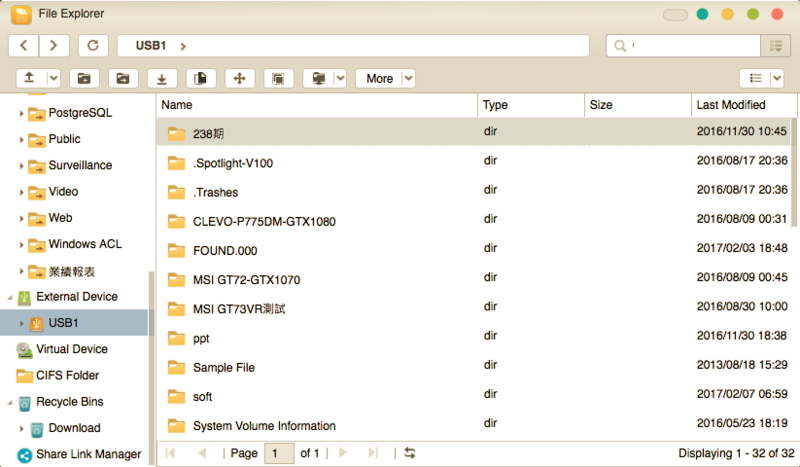 If enabling the exFAT driver was not successful, exFAT disks will show as unmounted in ADM’s File Manager. You will be unable to see the contents of the disk and will be unable to read or write data. In addition to reading and writing external exFAT devices, you can also use a storage device or an external device and format them with exFAT. Windows and Mac OS X have built-in support for the exFAT File system, so drives formatted as exFAT are now more convenient to use cross-platform.